Click to viewNikon also announced the D300 today, as was heavily rumored. Its latest prosumer DSLR is loaded with a 12.3 megapixel DX format CMOS sensor (the one Sony just announced), 6fps burst-it goes up to 8 with the optional battery pack, HDMI support with 1080i playback, 200-3200 ISO range, live view and a 3-inch viewfinder (the same as the D3's). It too is shipping in November, with a body-only price of $1799. This is a lot of camera for less than half of what the D3 costs. Nikon Also Preparing D300 for Thursday Launch? The D300 features a new 12.3 effective megapixel DX-format CMOS sensor that produces high quality images with fine detail and sharp resolution throughout its sensitivity range of ISO 200 to 3200. The camera's ISO range can be extended using its built-in options of Lo-1 and Hi-1 for the equivalent of ISO 100 and ISO 6400 respectively. The CMOS sensor's integrated A/D converter features the ability to select between 12-bit and 14-bit conversion, making it possible to shoot 14-bit NEF (RAW) format images. The D300 offers professional level high-speed performance with a shutter release time lag of only 45 milliseconds, camera start-up time of 0.13 second, and continuous shooting speed of approximately six frames per second. This speed can also be boosted to eight frames per second when using Nikon's optional Multi-Power Battery Pack MB-D10*. The D300 can sustain continuous high-speed shooting for bursts of up to 100 shots** at full 12.3 megapixel resolution, and it supports next generation UDMA high speed memory cards. 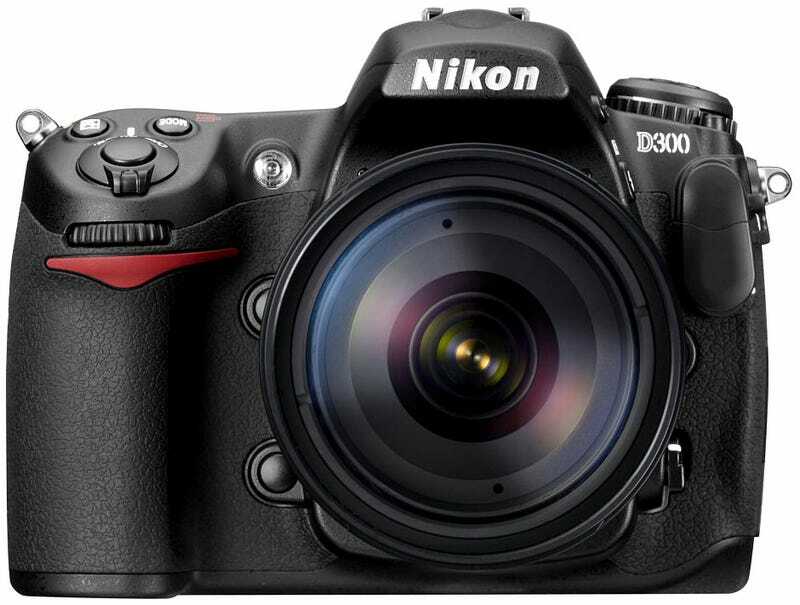 Similar to the Nikon D3, the D300 features the new EXPEED Image Processing System that is central to the speed and processing power of the camera. EXPEED delivers optimized performance for the camera and its features and ensures high-image quality and high-speed image processing. The D300 features Nikon's versatile Picture Control System that allows photographers to fine-tune and adjust fundamental rendering options for their pictures so they can define the exact tone, sharpening, brightness and saturation they prefer. They can then port these settings to any other Nikon camera featuring the Picture Control System, such as the recently introduced D3, so that even when shooting with different cameras, they can get consistent tones for all their pictures. The D300 features Nikon's Multi-CAM 3500DX auto focus sensor module, with 51 AF points, including 15 cross-type sensors that are located in the center of the frame. These cross-type sensors work with all NIKKOR lenses, including those with apertures as small as f/5.6. The D300's auto focus system is closely linked with the camera's innovative Scene Recognition System to deliver greater accuracy in subject detection and focus tracking performance. Nikon's D300 features a revolutionary new Scene Recognition System that greatly enhances the accuracy of, auto exposure, auto white balance detection and auto focus in the camera. The Scene Recognition System uses the camera's built in 1,005-pixel RGB metering sensor to recognize the subject or scene being photographed and detect any movement. This information helps optimize exposure and white balance settings for the recognized subject and also enables the camera to assign appropriate AF points based on any movement of the subject, ensuring highly precise auto focus tracking performance. The D300 features a gorgeous, ultra high-definition 3-inch LCD monitor with 920,000 dot resolution. The monitor provides a 170-degree viewing angle and is very effective in confirming focus on pictures as well as framing a shot using the camera's new LiveView modes. Two new LiveView modes in the D300 enable photographers to compose their shot using the camera's ultra-high resolution LCD monitor. The Tripod mode is designed for precise focus and accuracy when the camera is on a stable platform and the subject is not moving. In this mode, the camera focuses on the subject using focal-plane contrast and any point on the LCD screen can be selected as the focus point for the picture. The second mode, called Handheld mode, allows photographers to use the camera's conventional TTL focusing system, with all 51-points and 15 cross-type points available. When using this mode, the camera activates focusing immediately when the shutter button is pressed, to ensure accurate focus. Nikon's D-Lighting feature in its digital SLR cameras has proved to be a popular way for photographers to quickly compensate for dark areas of a picture after it is taken, without adversely affecting its highlights. The D300 features a new Active D-Lighting mode that, when enabled, provides remarkable real-time highlight and shadow correction with optimized image contrast. Active D-Lighting produces broader tone reproduction in both shadows and highlights by controlling highlights and exposure compensation while applying localized tone control technology to achieve a more pleasing level of contrast across the entire image. And because the advantages of Active D-Lighting are applied as images are captured, image editing time can be shortened. The D300 is the first Nikon digital SLR camera to employ a Self-cleaning Sensor Unit. Four different resonance frequencies vibrate the optical low pass filter in front of the image sensor to shake particles free and reduce the presence of dust in the camera. The D300's new eye-level pentaprism viewfinder offers virtually 100 percent frame coverage and 0.94x magnification for comfortable and precise composition. Photographers who need to make small adjustments to correct differences in focusing can do so using the D300's built-in capability to adjust focus specific to a lens. The camera offers the option of either setting compensation for a specific lens so adjustment in focus is only enabled when that particular lens is used, or the camera can apply a uniform level of compensation for any lens used with the camera. Users can store settings for up to 20 different lenses if they prefer to fine-tune the camera's focusing based on specific lenses. The D300 incorporates several features designed to ensure the camera performs reliably and consistently under demanding conditions. The camera's chassis is constructed of highly durable magnesium alloy and the body features numerous seals to protect the camera against dust and moisture. The camera's shutter mechanism is tested to 150,000 cycles, assuring a long life of consistent performance. The D300 is compatible with Nikon's new WT-4A wireless transmitter that provides support for wired LAN (10BASE-T, 100BASE-TX) and wireless LAN (IEEE 802.11a/b/g,). When using the D300 in LiveView mode, the WT-4A can transmit a remote view from the camera and also support continuous shooting through a wireless or wired connection using Nikon's Camera Control Pro 2 software (optional). The D300 is also compatible with the optional new Multi-Power Battery Pack MB-D10. This battery pack supports three types of batteries and features sequential power supply with auto-switching to the battery installed inside the camera body. When used, the battery pack can boost the D300's high-speed continuous shooting to eight frames per second* for up to 100 consecutive shots**.